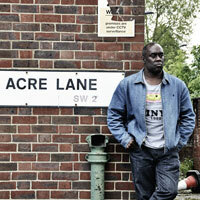 Translating the big, historical events of the early 1980s' Britain through the voice of a young Black boy coming of the age in the same era is the essence of writer Alex Wheatle's Uprising, which has just finished a second run at Wandsworth’s Tara Arts Studio. Through this play, the 40-something writer and MC shows us that history often moves in circles; economic crisis, cutbacks to social programmes, mass unemployment and despair, and you may feel that the play is set in 2011 and not 30 years earlier. Add discrimination in all fields, especially in education and employment, police harassment and all too frequent deaths in police custody - and a volatile mixture predictably exploded. This rage – which the mainstream media referred to as the Brixton Riot - is what Wheatle puts into drama. His versatile and creative writing has taken a perceptive eye to 30 years of Black culture in Britain; from the chat pon-the-mic lyricism of the 1980s sound-systems, evolving into the spoken-word scene, through to the urban drama genre. The Brixton bard’s acclaimed novels - Brixton Rock (1999) and East of Acre Lane (2001) - already deftly capture the spirit of the young Black male experience of the 1980s. So Wheatle the writer - who also lectures in prisons and schools - is well qualified to share his experiences in a concise autobiographical performance which relives his own take on that era. Told in several episodes fused with reggae songs, spoken word verses and dancehall style lyrics, his memories of the April 1981 rebellions are at the heart of this performance, merged with inspiring sketches of his eventual success as a writer. Just as important are the harrowing details of his early life; born out of wedlock and growing up in a brutal and oppressive Children’s Home is still clearly a raw scar in this writer’s life, and the experience may be the source of many bitter sweet tales. Although the void of family and community of his early years was substituted by a surrogate collection of hustlers and street corner dons, from Brixton’s Front Line the normality he craved didn’t come from this source either. And suicidal despair soon extinguished the euphoric aftermath of the Uprising as he again faced abandonment and isolation. But it’s the retelling of his prison experience which ignites the performance. With a Bible-chanting, karate expert Rastafarian for company, he soon developed a taste for books, literature and Black consciousness which laid the foundation for a future career, first with Brixton sound systems, then as a street corner poet and finally a novelist. Tara Arts Founder and Artistic Director Jatinder Verma, has given the strong-voiced Wheatle a free hand to relate his story with a simple and straightforward direction. With just a table and chairs as props and a solitary black Stetson hat to impersonate a character from his days on the Front Line, Wheatle prowls the compact floor level performance space, relating his at times hilarious, sometimes disturbing anecdotes with intimate and refreshing honesty. Although he’s not a natural storyteller, his sometime disturbing experiences are told with no embarrassment at all. Ending after 45 minutes I wanted to hear even more of this engaging Wheatle’s tales. And with his intention of taking Uprising on a tour of the literature festival circuit I suspect the writer and performer has more to give.